Our church has a christian school and I was asked to make corsages for the teachers. Making your own corsages is more economical, and makes a nice appreciation gift for the teachers. 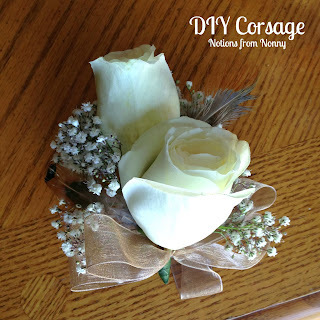 I was able to make these corsages for just a few dollars. It is best do neutral colors when you don't know what they are wearing. I went with an ivory rose, baby breath and pewter ribbon. I also added neutral colored feathers to make it fancier. 22 Corsages later.....here is how they looked! I will check out your hop! Thanks for stopping by! Thanks for stopping by!! I'll be visiting soon! I had the privilege of receiving and wearing one of your beautiful corsages. One of my students asked if I had chosen my outfit just to match the flowers!! Not knowing they were from you, I told Diane Estes that they were the prettiest corsage we'd ever received!! Thanks!! You've been busy, and they turned out gorgeous!